Coconut is really a great gift of nature not only to mankind but also to all beings. Considered by many to be the single most useful "tree" on Earth. Botanically-speaking palms are not trees but are more closely related to grasses. In Sanskrit, the coconut palm is known as kalpa vriksha, meaning “tree which gives all that is necessary for living”, because nearly all parts of the tree can be used in some manner or another. The English name “coconut”, first mentioned in English print in 1555, comes from the Portuguese and Spanish word coco, which means “monkey face”. Explorers from the Iberian peninsula found a resemblance to a monkey's face in the three round indented markings or "eyes" found at the base of the coconut. Coconut is hard and tough outwardly but very soft and nurturing inwardly and symbolizes “a true concept of ideal personality”. On the Nicobar Islands in the Indian Ocean, coconuts were used as currency for the purchace of goods until the early part of the twentieth century. The fruit-bearing palms are native to Malaysia, Polynesia and southern Asia, and are now also prolific in South America, India, the Pacific Islands, Hawaii and Florida. The light, fibrous husk gives the seeds great buoyancy so that they can easily drift on the ocean currents to propagate around the world's oceans. Coconut has become a part of South Asian and Indian culture and is grown all over the world, in coastal regions and places near the sea. It needs hot climate and damp soil with salt in it. 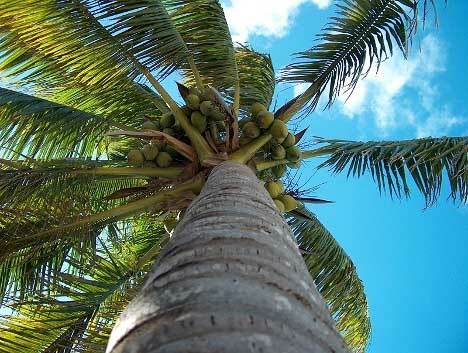 There are many mythological stories around the origin of coconut. The presentation of coconut at auspicious occasions and religious and social functions, indicate advent of an eventful of happiness and prosperity. 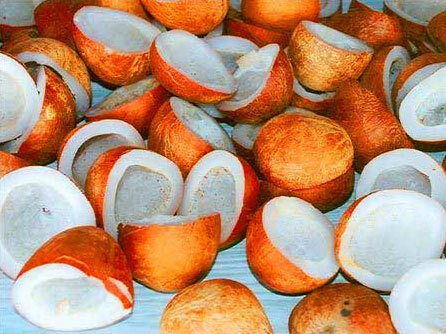 In some cultures coconut is considered a divine fruit and enjoys special status in social ceremonies. Coconut fruit, though a bit heavy has a cooling effect on the body. It is diuretic, and gives instant vigour and vitality. Its raw fruit has creamy delicious soft pulp and is carminative (relieves flatulence), digestive, blood purifier and a tonic. It has been found excellent for the immune system. Water of raw coconut is cooling, quenches thirst, is easily digested is anti bilious, anti phlegmatic tonic for the heart and is recommended even for infants. 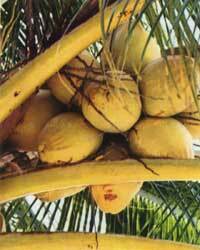 Ripe coconut gives energy, removes ailments due to wind, bile and is a blood purifier. The pulp of coconut is immune to any infection and is very safe to consume. Coconut oil is not only extensively used for black, soft and lustrous hair but also as a cooking medium. Not the place to pitch a tent! Various tasty food -stuffs, sweat meats, etc are prepared with coconut. Besides the coconut fruit, its bark, shell, leaves, stem all have different other uses. The outer covering of coconut is used in making many decorative materials. Hard bristles on the shell are used for making brooms, brushes, door mats, ropes, and cushions for sofas, chairs and mattresses. The dye is also made from the bristles and the shells by burning them. Its leaves are used for thatching the roofs. It is considered that by burning the roots, the atmosphere gets purified. Coconut oil's saturated fat is of the medium-chain fatty acid variety. These medium chain fatty acids are digested more easily and utilized differently by the body than other fats. In short, whereas other fats are stored in the body's cells, the medium chain fatty acids in coconut oil are sent directly to the liver where they are immediately converted into energy. So when you eat coconut oil, the body uses it immediately to make energy rather than store it as body fat. Because this quick and easy absorption puts less strain on the pancreas, liver and digestive system, coconut oil "heats up" the metabolic system and is outstanding for those with thyroid problems. Coconut oil will actually speed up metabolism, your body will burn more calories in a day which will contribute to weight loss, and you'll have more energy. Studies have shown the opposite for unsaturated fats which can cause hypothyroidism and lower your metabolic rate. Perhaps even more important, virgin coconut oil is rich in lauric acid, a proven antiviral, antibacterial and antifungal agent that is very beneficial in attacking viruses, bacteria, and other pathogens, and that builds the body's immune system. The lauric acid in coconut oil is used by the body to make the same disease-fighting fatty acid derivative monolaurin that babies make from the lauric acid they get from their mothers milk. Finally, coconut oil contains no dangerous trans-fats, which are found in vegetable oils (including olive oil), margarine, shortening and other oils. Trans-fats can raise LDLs or "bad" cholesterol levels and lead to clogged arteries, heart disease, type-II diabetes and other ailments, and should be avoided. Researchers stated that there was no evidence in Islanders who constantly used coconut oil to cook with of heart disease, diabetes, cancer or any of the common degenerative diseases known in Western cultures. So, even large quantities or large consumption of coconut oil did not cause or contribute to heart disease. The fresh coconut flesh is shredded, and then pressed to make coconut milk. The milk is then fermented for 24-36 hours, and the oil is then separated and filtered from the curds. It is ideal for deep tanning, in fact when I went on holidays with my sisters and niece, my younger sister and I used coconut oil and didn't burn but just went brown and my older sister and niece didn't use anything and got sizzled. Coconut oil is great for a sensuous massage, dry skin, a bath moisturizer, an alluring fragrance, or nourishing the hair to give it a healthy shine and fewer tangles. South Pacific Island women enjoy its ability to enhance the skin during pregnancy and reduce the number of stretch marks afterwards. In Indonesia woman have a secret formula that contains coconut oil and ginger amongst other herbs to get their figure back in shape straight after giving birth. The oil is sometimes soaked with flower petals from the gardenia, frangipani and other scented flowers. It may even be soaked with vanilla. Just looking at these coconut palms does us good - imagine being there! Consuming coconut water of the raw coconut everyday eliminates fatigue and gives you vigour and strength to your body. Taking dried coconut pieces with milk is a very good aphrodisiac for it helps in regaining lost energy. Eating coconut in raw form also gives vigour and strength. Taking the water of tender coconut before going to bed Induces sleep. Eating the pulps of tender coconut and drinking the water along with one tsp of olive oil for 3 days destroys and eliminates stomach worms. Stomach ache due to acidity can be helped by taking Green coconut water after food. Regular intake of tender coconut water alleviates liver Problems. 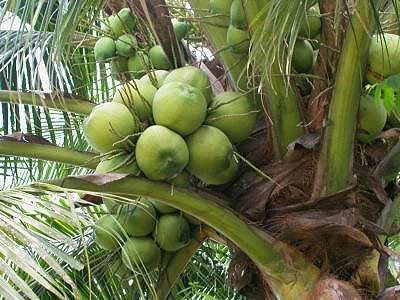 Taking regularly, tender coconut water helps Urinary problems such as strangury, polyuria etc. Consuming tender coconut water eliminates hangover due to liquor. Massage with coconut oil mixed with lemon juice eliminates itching. Applying coconut oil with a little camphor also gives quick relief in Itching. Tomato juice mixed with coconut oil relieves itching. Cold water abrasions of the skin can be helped by coconut oil on the face, legs and feet. Drinking tender coconut water regularly helps in breaking gall and kidney stones and pushing them out. Taking coconut kernel and palm sugar or jaggery daily for a week eliminates common eye problems. Applying old coconut oil with radish juice on the affected part eliminates poison. Rubbing coconut oil with basil juice on the burns gives relief. Burn marks will also disappear by applying coconut oil regularly. Massaging the scalp regularly with coconut oil mixed with a little camphor removes dandruff. Applying coconut oil on hair helps in checking greying and falling of hair and imparts lustre. Eating coconut kernel with palm sugar during pregnancy helps in child's growth and easy Delivery Taking coconut oil with palm sugar or jaggery after delivery for 2-3 days gives quick relief of pain. Taking 2 GMS of burnt ashes of coconut shell bristles with water stops nausea and vomiting. Drinking tender coconut water 3 to 4 times also controls vomiting. During typhoid, malaria and other fevers, taking tender coconut water is beneficial. Persons suffering from cough and asthma should not take coconut pieces as it may affect the breathing passages. Excessive intake of dried coconut pieces causes constipation and flatulence, EVERYTHING IN MODERATION. A well-known tree of enormous economic and nutritional importance in many tropical countries. Many parts of the palm are exploited, but the fruit or coconut is most useful; for this reason cultivated varieties have been bred which produce too to 2oo coconuts each year. The generic name Cocos is from the Portuguese for monkey, as the nut looks like a monkey's face; nucifera means nut-bearing. Description Palm tree to 25 m; trunk usually curving to one side and regularly ringed with leaf scars. Leaves in a terminal crown, very long (5 m) on a yellowish petiole which is deeply embedded in loose fibre surrounding the trunk; deeply pinnate and pendulous. Flowers followed by ovoid nuts 20 Cul long, usually in bunches of up to 20. Distribution Native to Malaysia and Polynesia; widely distributed throughout tropical zones. In coastal situations or occasionally inland. Cultivation Wild. Widely cultivated commercially. Constituents Oil, comprising the glycerides, trimyristin, trilaurin, triolein, tristearin and tripalmitin; also the glycerides of caprylic, capric and caproic acids. Uses (Oil, ernels, seed, leaves, sap) Nutritive: anthelmintic. 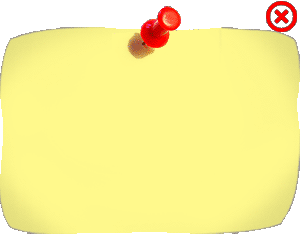 The seed is sometimes used as an anthelmintic in tropical countries. Fractionated coconut oil (containing medium chain triglycerides) is used in certain diets for conditions such as cystic fibrosis and steatorrhoea whe.e patients are unable to absorb normal fats completely. The oil is used as an ointment base, and in massage creams and certain medicated shampoos. Also used in sea-water soaps, and formerly in margarine. Wide culinary use of the kernel as a food and flavouring, particularly in Indonesian cuisine., and the apical bud or 'cabbage' of the trec is eaten as a delicacy. 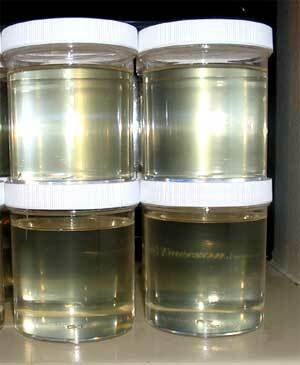 The fermented sap is employed in palm wine and spirit manufacture. Leaves are extensively used in basket, mat and rope manufacture; the husk fibre from the nut is similarly used in coconut matting and rope. What palm has more uses than any other plant?